When I was a kid, I read in amazement as the British Gentleman Phileas Fogg made it AROUND THE WORLD IN EIGHTY DAYS. The explorer trekked across the world with pocket-watch precision, using rail, steam, all of the modern conveniences of the late 1800’s, to complete an unimaginable journey around the world. As I headed in to work this evening, I stopped and grabbed dinner. I paid with my Paypal card, checking my current balance on my phone. I also looked at the newspaper. 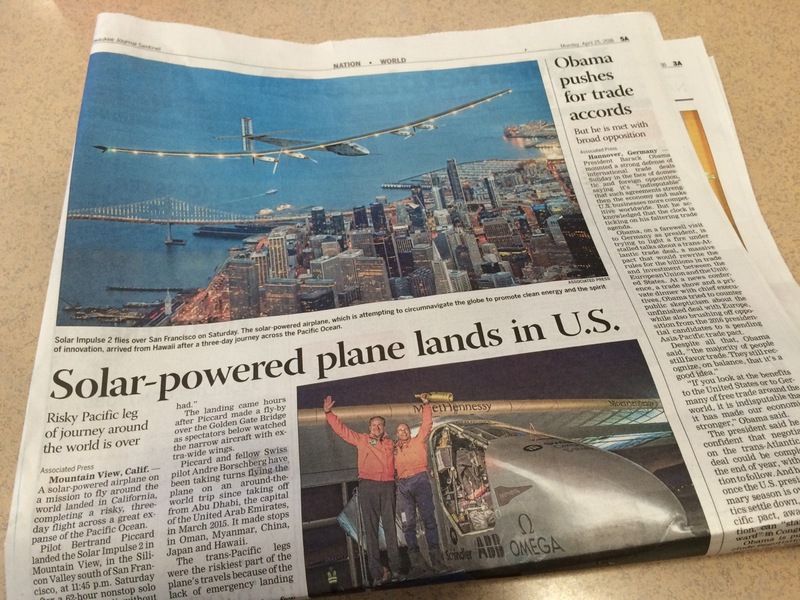 On the front of the World News section was an article about a solar-powered airplane landing on the United States mainland, on its trip around the world. Kitty Hawk was only a little over 100 years ago. Now, we aren’t too far from perpetual solar flight. Imagine a world in which a solar powered airplane just circles, day and night, broadcasting from Wi-Fi?! Two weeks ago, SpaceX landed a rocket on it’s tail-fins just like in a Marvin the Martian cartoon. 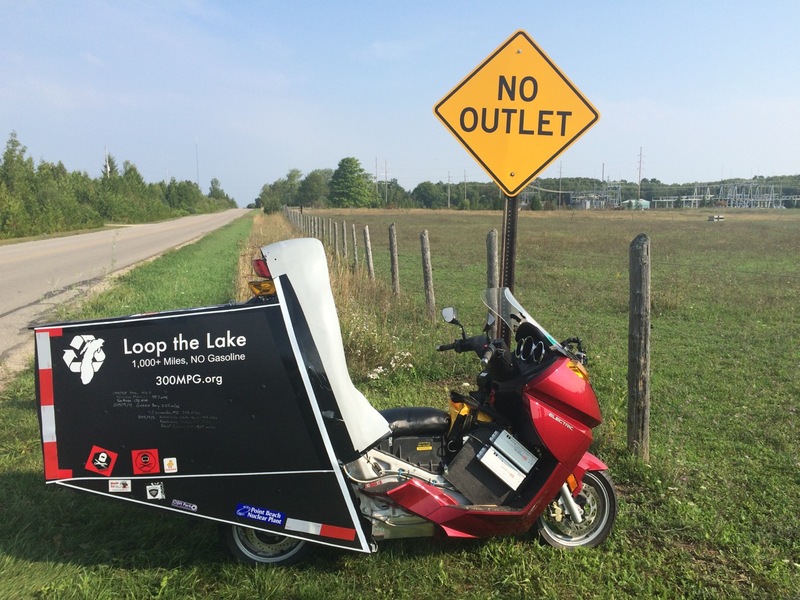 Recently, a number of folks have criss-crossed the country setting all sorts of records on electric motorcycles. Modern Gentleman Explorers are bringing us the future RIGHT NOW! But it’s not just Elon Musk, Bertrand Piccard, or even Terry Hershner. There’s lots of us living in the future every single day. While I’m no pilot, I, like many of us, drive a car. Every. Single. Day. And while I’m not crossing the country, I’m still usually driving on solar power. I charge my car at home. No, the car isn’t covered with solar panels. I don’t even have solar on my garage. I just have one solar panel on the roof of my Little Girl’s club-house! Still, it’s enough to provide 40% of the power to the car while I charge it. I’m using a small grid-tie inverter. As long as the sun shines, and I have the car plugged in, it just slurps up the solar energy. At night, (or cloudy days) my house is still 100% renewable energy powered through a program from my local, municipally-owned, co-op electric power utility. My car isn’t even a Tesla. Nope, it’s a heck of a lot better than that, because I can AFFORD the car I drive! I’m in the wrong tax bracket for a Model S, and the Model III is still a few years out. 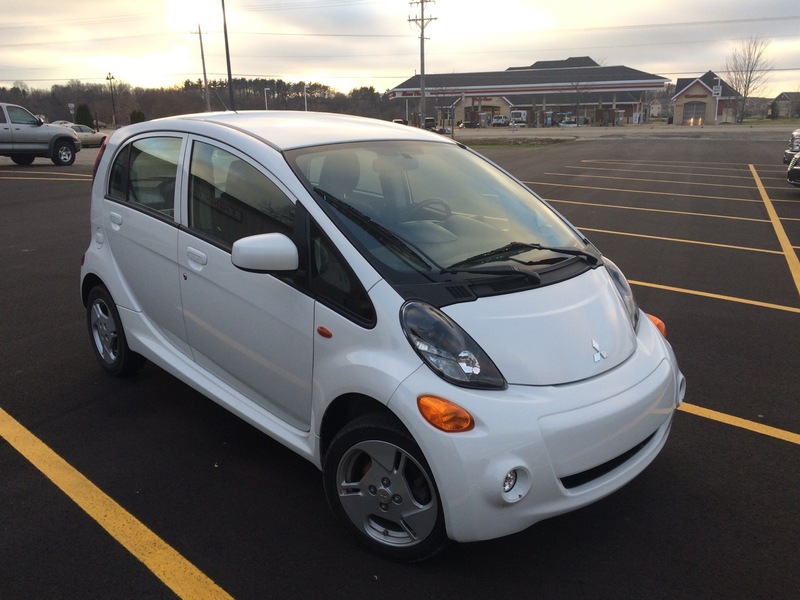 In the mean time, I’m pretty happy driving my renewable energy compact car. I’m not the only one. Even my 5-year-old girl has a solar-powered car, that she even helped build. Unlike SpaceX, it’s NOT rocket science – just a kids PowerWheels car that’s been modified with a solar panel and an updated battery. On the other hand, I’ve NEVER had to plug it in! 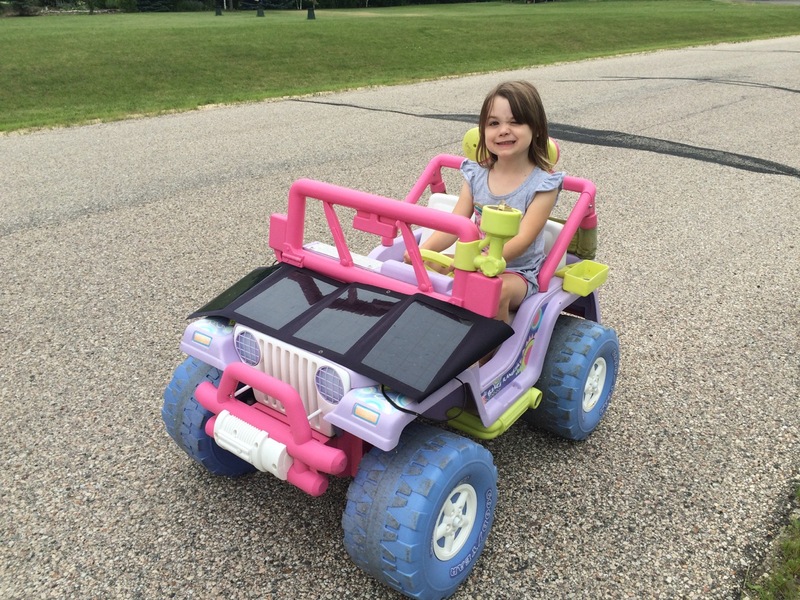 Even the naysayers that usually suggest that all electric cars are powered by coal get a kick out of the Barbie Solar-Powered Jeep! It makes me wonder what will happen in the future. My Little Girl might NEVER drive a gasoline car. EVER. Who would want to, with all the extra cost of fuel and maintenance? Her first car might be an old beat-up Model III! She might not drive at all. I can’t imagine how our transportation system will change when Uber and Tesla Auto-Pilot merge. When I saw the official release of the Model III, it looked like the driver’s seat was designed so that it would act as one more passenger seat. Why have a driver’s license, when you tap your phone and a car comes right to you and picks you up!? TOTAL RECALL’s Johnny Cab isn’t that far away. We are living in an amazing time. The future is happening right now. When I hopped on an electric motorcycle and rode 1276 miles AROUND Lake Michigan, without using a single drop of gas, maybe I was just living the dream of a 10 year old boy reading Jules Verne. I wonder what Phileas Fogg would think of that?